A mixed martial arts fighter who was born with an underdeveloped left arm checked in with a group of Marines and other troops who lost limbs in combat. 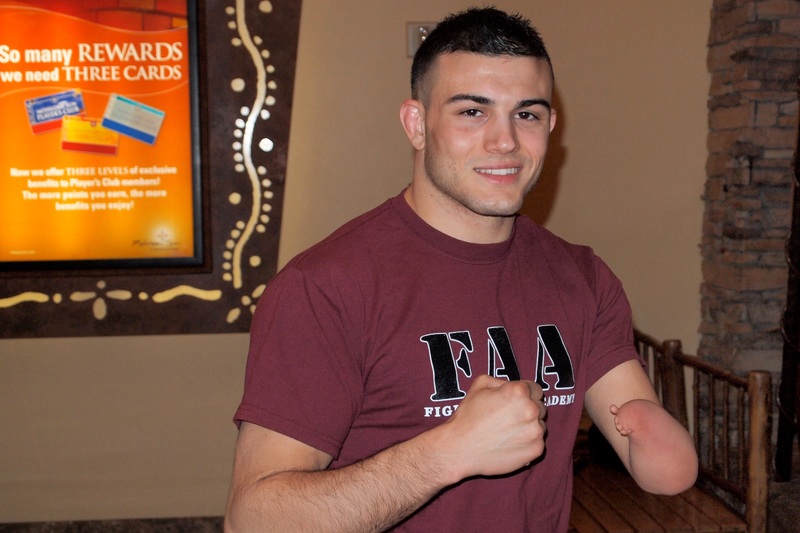 Nick Newell, a World Series of Fighting lightweight star, visited with members of “Operation Warrior Reconnect,” the Los Angeles Times reported. He met with the troops last Wednesday in Camp Pendleton, Calif., and was humbled by their appreciation of him. The 27-year-old MMA fighter was born with congenital amputation, a condition that can cause a baby to be born with a portion of a limb, or an entire limb, missing. In Newell’s case, the left arm stopped growing just below the elbow. A few days later after his visit with the troops, Newell defeated Keon Caldwell in the lightweight battle during Saturday’s WSOF 4. The WSOF also did an entire so-cal tour across military bases. I love seeing an organization support our troops and give thanks for the sacrifices that they make. very inspirational. We have a coach at our gym w/ cp and it is awesome to watch him train and compete. also great to see people supporting our marines!